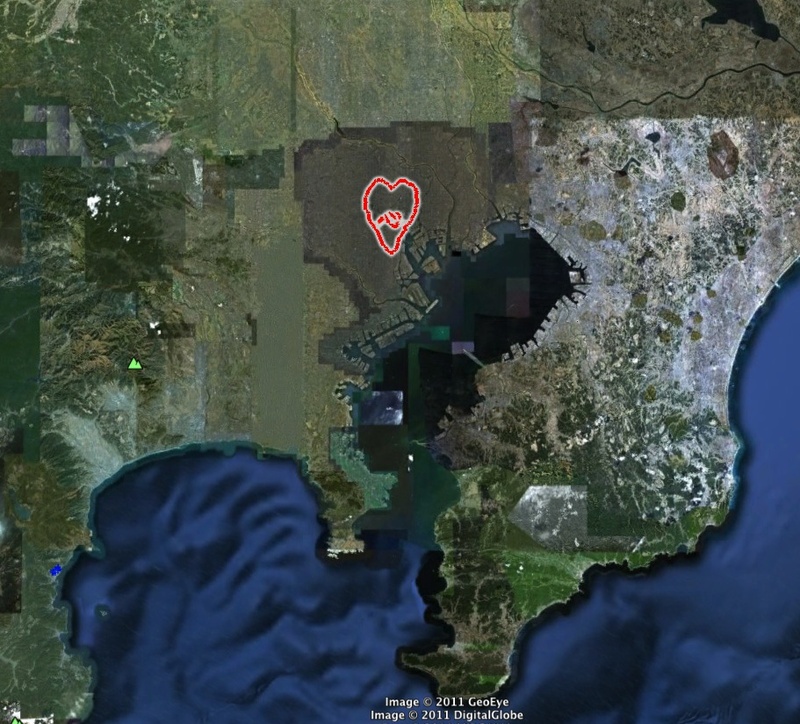 On April 22nd 2011 I undertook the longest Art of Running challenge that I have attempted to date: a 50km heart around the city that I love. Inside of the heart I then drew a the character ‘心’ which means mind/heart/spirit/inner strength. As it happened, I made a bit of mistake during this run by miscalculating our average speed over the first 10km. As a result of that, I speeded up to an unsustainable pace without really being aware of it. This, combined with the fact that I hadn’t really run in two months (since the Tokyo Marathon) meant that my body wasn’t too happy – and sure enough, at about the 15km mark I was beginning to wince with the pain in my left knee. I would later find out that I had given myself Iliotibial band syndrome, and wouldn’t be able to run for 5 weeks afterwards! Anyhow, the first 25km had taken a lot longer than expected, and coupled with the pain in my leg we decided to split it over two days. That didn’t really help much though, so the second 25km were the most painful I’ve ever been through, but nonetheless, we did it! I was happy to have a good friend cooltiger join us for the second day – she was a great support. She has an interesting running project, whereby she combines running with stops at bakeries, samples their nicest breads and interviews the staff. You can find her bilingual site here. Cooltiger also took a bunch of photos along the way – check them out here. This route was partially inspired by a ‘natural’ feature of Tokyo – the Yamanote loop train line (in green in the image to the right) that is, in a way, the heartbeat of the city, connecting all of the major stations. However, it needed a few refinements, thus we extended the course a fair but to the West, and also dipped further down at the top. 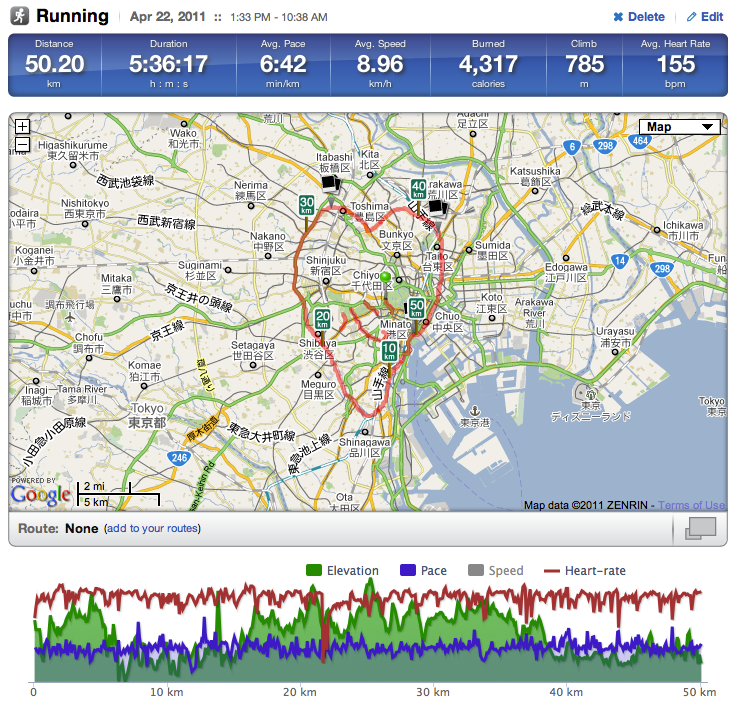 This run was actually a fair but further than 50km – I’m not sure of the exact distance but the untracked sections between the kanji strokes and the outer heart certainly added up – plus we got a bit lost at the start! I was wondering – would this be visible from space?! I just wish that artists wouldn’t directly rip off another artists brilliant idea. And then plaster credit for it on sites like Giant Robot. Thanks for the link! I’d not heard of Vicente Montelongo before today or seen his artwork – impressive! Having said that, I’m appalled at the way every artist who uses a traditional brush has stolen the idea from the first artist that did that – without attribution!